As one of our first projects, J+E was challenged with the conceptualization of a new dating app that specifically tackled the varied and non-binary LGBTQ community. As great as the design challenge already was, we were thrilled to jump into the research—neither of J+E's principles having ever used online dating products before! The solution was initially intended to be a web-based experience that distanced itself from both the more tedious services (Match.com and eHarmony) and the more superficial competitors (Tinder, Grinder, and Craigslist). User tests of the experience and functional prototypes quickly redirected our efforts towards a more robust mobile native-app solution. Iris Mingle was designed to work on both desktops and tablets as a web-based service and, ultimately, on mobile devices as a native app—each in response to different user needs. We were completely new to dating apps but knew, right away, that the non-binary realities of dating in the LGBTQ community would be at odds with the best practices demonstrated by heterosexual dating products. LGBTQ gender identities doesn't lend well to the limited filtering features available in the dominant heterosexual dating apps—a new paradigm needs to be identified. A married couple of business partners should never try to find each other on Tinder. Never. While most dating apps currently riff on Tinder's model, our aim was to create a new experience that addressed the unique needs of the LGBTQ community while respecting user expectations established by exisiting apps. Find a happy medium between the rapid-fire interactions of apps like Tinder and more in-depth dating products by prioritizing content discovery without requiring frequent page-loads and by letting user defer their content input. Borrow lessons from more complex search and e-commerce systems—such as Amazon, Google, Getty, iStock—to allow for the better filtering of results. Respect dating site best practices—such as those infamously learned by Dating Ring on Gimlet's Startup podcast—by keeping photography front and center while associating all secondary content to this critical media. We took the functional prototype out on Pride weekend in Atlanta to gather feedback and were surprised both by the LGBTQ community's enthusiasm for the product and by their strong feedback against our initial web-based solution. Our image-based interface, with its emphasis on fewer page loads, and in-line messaging user interface were well received. Users were, however, dismissive of the platform, suggesting they had no interest in a web-based solution in lieu of a native mobile app. This preference derived both from the personal nature of the service—one they specifically wouldn't want to experience on work computers—and their desire to search potential partners on the go. A mobile app pushed us even farther away from a clicks-based metric and encouraged a more gesture-based approach. Filtering the feed of potential matches quickly became the project's main challenge. In heterosexual dating apps, results filtration is typically based on a binary preferences (occassionally combinations of the cis male and female binaries, as with 3nder/Feeld, AdultMatch, and Craigslist), age, and distance. But the wider variety of LGBTQ identities and orientations suggested a more robust solution derived from multi-variate e-commerce and search-engine filters. There were also a number of content strategy issues to consider: How to balance user-generated profiles with enterprise-generated content, how to distinguish favorited from matched profile (especially since we didn't want non-favorited profiles to be hidden automatically) and how to nest personal summaries, questions, details, additional photos, and a chat function (no email!) in-line into the browsing feed.. Adapting the brand's signature rainbow to serve as an in-app animation proved a fun way to add life to the product. 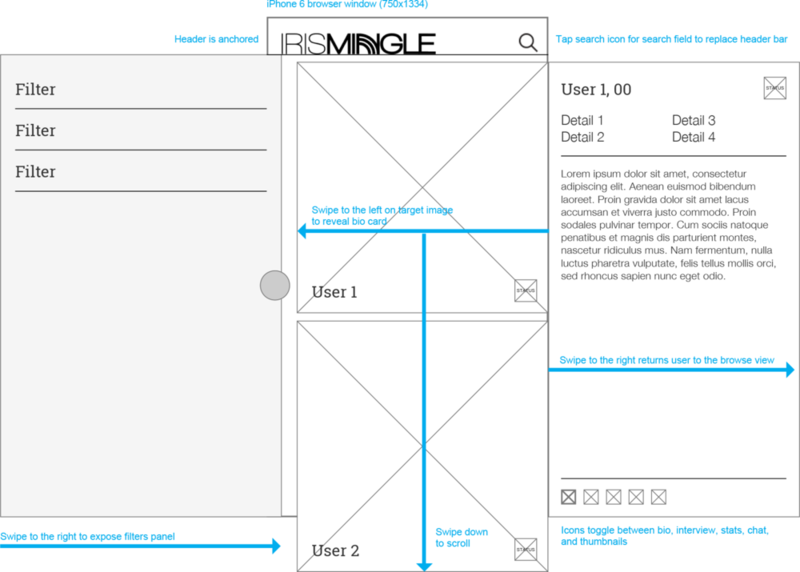 The initial desktop/tablet wireframes focused on a web-based experience that drew lessons from photo sharing and stock photography website filtering. Page loads were also minimized by taking advantage of expanding and collapsing UI best practices present in current-generation search engines. The resulting high-fidelity execution made it quick and easy to adjust filters, find a match, browse details and photos, and even start up a conversation—all from one screen. Iris Mingle built its initial user base by targeting segments of Atlanta's very active and very supportive LGBTQ community. By inviting and engaging with the most passionate members of the community, and by focusing on ATL as the first market for adoption, Iris Mingle hoped to mirror the success of other highly-targetted, highly localized online products (such as Scoutmob and MailChimp). Additionally, it was clear from the success of hook-up apps like Grinder and Tinder that speed to interaction is paramount. Indeed, this isn't unique with dating apps. Countless usability studies have shown the risks inherent with fating content behind a login or account creation process—if users can't assess wether or not they want your content then why would the go through any measure of tedium to access it. So Iris Mingle gave new users the opportunity to defer entering the account details. After a quick account creation process, users could enter a minimum of details and then jump right into the feed. Or they could be more thorough—ideally, presenting themselves as a better match—from the get go. In either case, access to their potential matches was only ever a set away without sacrificing the detailed profiles that make the most popular dating apps (Match.com and eHarmony) successful. Invitation emails were sent to a wide variety of appropriate user segments in Atlanta's LGBTQ community. Account creation on most dating apps is notoriously tedious (such as Match and eHarmony) or almost totally absent (such as Tinder or Grinder). Account creation basics can be exhaustively completed or bypassed, letting potential users build robust profiles or get right into the feed and find what they're looking for. When the functional prototype was complete, we took it out and tested it on Pride Weekend in Atlanta. Users received the product very favorably—better than expected, to be sure—but were nearly unanimous in looking for a native-mobile solution in lieu of the web-based platform we'd developed. Back at the drawing board, we took the lessons we learned from the web-based iteration and conceived of a gesture-based interface that took advantage of mobile usability patterns without discarding any of the in-line interactions we'd worked so hard to bundle. The result (shown below) makes it possible to scan the feed, edit filter settings, browse user photos and details, and start a conversation with only gestures (and the occasional tap) but without any new page-load. The mobile native-app adaptation utilizes swiping as the primary means of navigation, reflecting the desktop execution's consolidation of interfaces and clicks.